Welcome to Sweet Memories Coventry - Fresh Indian sweets centres Mithai shop - Punjabi indian sweets Foleshill Road Coventry West midlands UK. 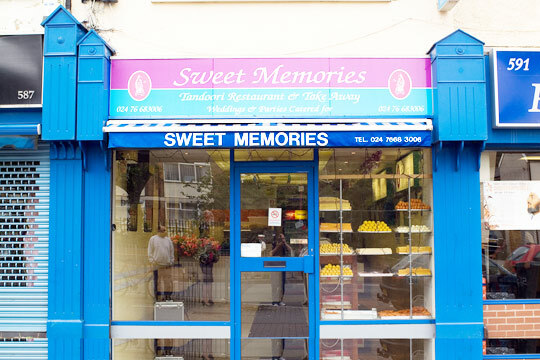 Sweet Memories Coventry is a family run business conveniently situated on Foleshill Road, providing the very best in Indian Sweets and Savouries. Since the day it was started it has delivered the very best in Indian Sweets and Savouries and this is shown by the immense satisfaction of customers and their willingness to come back again and again for the sweets. We offer a wide range of delicious Indian sweets that are available in different colours and flavours for every occasion and celebration. We invest the greatest of care in every sweet - everything is homemade in a clean and controlled environment. We make a variety of sweets and snacks to turn any occasion into a special occasion by providing an excellent service to our customers and insuring that our Indian sweets are of the highest standard. We ensure our prices are competitive and all our sweets is made using the traditional method giving hygiene the top priority. Our personalised customer service and low prices are what set us apart. Call us now on 024 7668 3006 or visit our shop in Coventry, Warwickshire to sample our sweets.